You know most people want to look at numbers or gameday box scores and criticize you when one goes ofer, whether its 0-3, 0-4, 0-5, even 1-4. When you read box scores you dont know what happens. I lined out, flew out deep, had a diving play against me and I am 0-3 and everyone wants to make assumptions. To me here at the AFL it is not just about producing results. Yes, its great to hit 400 in this league or a high 300 but for me being here I need(ed) to work on one thing, to be as patient/aggressive as possible. For those who read these probably know every stat possible, they know that I got hit more than I walked this year. My patience at the plate was questioned because I only had a few walks. The thing that people need to realize, when you are a hitter, a good hitter, you have a certain confidence that you can hit anything. Thats where I ran into problems. This fall I planned on coming here to prove I can walk, get my hits, but build up my OBP as a good 2 hitter would. Yes its only been a week, but I have only played 3 games and have 4 walks. For me that makes me ecstatic, I am getting on base for those behind me who are the run producers and I’m doing it by being patient. When you put your mind to something your determined to get better at I really feel like results will show. The first week of this fall league showed a lot about our team and this league. Considering we have only played 5 games you can tell what its going to be like. Clutch hitting, good defense, and very good arms. The Scottsdale Scorpions are loaded with offensive weapons and I feel we have the best arms in the league. These guys throw hard, good movement, and have very good out pitches. The Giants guys are playing great, with Billy Sadler, Pat Misch, and Justin Hedrick dominating out of the pen. Freddy and Travis are playing well and just waiting to get back in that groove of playing everyday. By the end of this thing I feel you guys will see some great things from the Giants and have much to look forward to from the group thats here. Drop me some questions and hopefully I can write another blog soon and give you all more updates. Hello everyone, I’m here writing in the sunny and always beautiful Arizona. 6 months of baseball has been complete and now 2 more months of fun and intriguing games to be played. Thanks to all for the nice comments throughout my roller coaster year and especialy when I broke my jaw. Always nice to read the comments on everyone I just did not know how or if I should have written about the injury. In the mean time, I am on the Scottsdale Scorpions just loaded with a ton of great ball players. From my experience last year in this league every team is loaded, but their is something different this year. It seems as though in the week we have been together the team has clicked. Instead of being just comfortable with your organization (Giants, White Sox, Brewers, Angels, and Diamondbacks), all of the guys seemed to have already mixed, making it a feeling of a possible successful team. I am here not to just be here. I am here to play, to win, and to prove to a lot of people that I can and will play at the next level. I might be the utility guy here but that doesnt mean I am not a forgotten, in the Fall League the organizations draft for positions and I was fortunate to land on a team to even play and get at bats. Over the fall I will be keeping you guys posted on the progress we are making as a team and also my experiences. Thanks again and cant wait to hear back. interesting to happen in the road through the minors these past few weeks. Thanks for all of the comments I have read them all and appreciate the feedback. (minus the lone Dodger fan). the batters box the next night in front of 32,000 in San Diego. on my back?. (another blog soon to come). talking the game and situations that had occurred or will occur during a game. we really hammered that aspect, and it really paid off the last few weeks. goal?..and hopefully it will be the usual dirty uni that I put on. So I hope I find everyone in good health and having a great summer as July is near the end and the last few months of the season are near and playoffs are in our sights. If one were to tell me I would have been traveling and playing in Las Vegas, Tuscon, Tacoma, Portland, Colorado Springs (twice), New Orleans, Oklahoma City, and Salt Lake I would have probably agreed with you. But to tell me I would have had the privilege to play in San Francisco, Milwaukee, Philadelphia, New York, Florida, San Diego, and Denver, hitting off potential Hall of Famers and All Stars, and being in the lineup for one historic home run, I would have laughed in your face. But that’s where I have been this year, 16 different cities, 13 different states, and hopefully many more to come. From getting my first hit off Miguel Bautista, to fouling a batting practice ball off of Barry’s forehead, to hours of extra work in Fresno my year has been pretty amazing and hectic. I can write forever so I am going to try to keep this simple and let the feedback I get let me know what I should write about. I will talk a little about the experience of being an everyday ball player to being a bench player in the Big Leagues. Now I am in the same shoes as many of the players today or what some of the guys have had to go through throughout their careers, not being an established everyday Major Leaguer. So to say my first call up was a surprise would be an understatement, but to add to that starting everyday would be my role up in the Big Leagues for 15 days would have been beyond my dreams. That’s what I was fortunate enough to do play everyday for about 15 days and then got my first "demotion" back down to Fresno. Met up with the team in New Orleans where I caught the same flight and sat next to Saints’ first pick Reggie Bush. Was in Fresno for seven days before I got another call-up this time to be a bench player. Now don’t get me wrong when I say bench player in the Major Leagues. I will say it was an honor but also one of the biggest learning experiences of my young baseball career. Without the help and guidance from Todd Greene and Mark Sweeney, I would have been lost. I latched on and tried to pick their brains, even being a little annoying at times to them. But they were the first ones not to turn their heads away. Instead they came at me and taught me so much about the game. Let’s be honest here, Mark Sweeney might be the game’s best pinch hitter. That’s not a knock on him, rather it is a huge compliment, because what he does in my eyes as a pinch hitter is amazing. He is aggressive when he gets that at-bat, but with a plan. He battles against the game’s best relievers, he comes up with clutch hits, home runs, walks, whatever it may be consistently. That is the most glaring part of his game, off the bench he never gives in. I was able to pick his brain a bunch to try to gain a little grasp of it, so I would be ready and be ready for those spot starts…. May 28, 2006 — four days after my 24th birthday — I found myself receiving a present from manager Felipe Alou: a start. 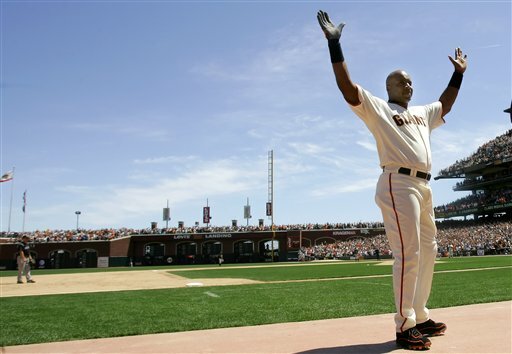 Now at this time one man, Barry Bonds, was standing at 714 home runs, the ballparks were filled and the fans were electric. Well being one of those fans in that ballpark for years going nuts every time he was up, it was now even more surreal because I was not only in the dugout, but the lineup the same day he hit 715. Byung-Hyun Kim gave up 715 and I will never in my lifetime hear a place louder and crazier than when he hit that line shot to right-center field. (Where, by the way, how do you let a ball hit off your chest and down to someone buying a hot dog? Come on.) The sound off his bat and the roar of the crowd has been embedded in my mind. Champagne, toasts, pictures, and the memory of that day will always give me bragging rights to my buddies back home, all die-hard Giants fans, but I was there, and I was in the lineup. A few days later the fantasy was over and I was back in Fresno. An eight-day trip to Florida and New York, followed by the demotion and a 14-day road trip left me a little tired. But at the end of the trip I found myself back in the League, as a bench player, but with a little more knowledge of what to do. So three times I have been up — hopefully more to come. I have met the games best people: Todd Greene, Mike Matheny, Randy Winn, Mark Sweeney, and all the other Giants, to Craig Biggio, Michael Young, and Albert Pujols. I have had great memories and learning experiences that continue to make me a better ball player. I have one goal in mind and that’s to be an everyday Big Leaguer, and that will only come with time, patience, and opportunity….and I am very grateful for the opportunity the Giants have given me thus far.